Throughout my career, I’ve worked in large organisations. And every single large organisation – from highly profitable businesses to multilateral institutions – goes through swings and cycles of “change processes”. The organisation I work in now, UNDP, has just gone through a “change process” to decentralise operations from New York to regional centres and country offices. Indeed, many “change processes” pivot on one key issue – how centralised or how decentralised to be. And as this HBR article illustrates, that choice is far from simple. China watchers like me will have noticed that on Monday, a new piece of legislation was published on China’s Ministry of Commerce (MOFCOM) website, focused on China’s assistance to other countries. In fact, a draft of the legislation was released in April, but has now been finalised after consultation. So what’s important about this legislation? Here is a short video that explain it so that you can make your own judgement. But in my view, what’s important is the change process it implies. The legislation implies simultaneous centralisation and decentralisation. The legislation implies that decision making around foreign assistance will be centralised towards MOFCOM, rather than any other Ministry in the government. The legislation says that MOFCOM will now write country strategies, develop a project database for foreign aid projects, and collect all the data on and evaluate those projects. But there will also be decentralisation. In future, more and more activities that take place within MOFCOM will be pushed to the country-level, and specifically the economic counsellors in country. 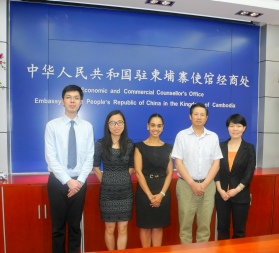 Economic counsellors often have separate – and smaller – offices to the Chinese embassy, but are nonetheless very critical partners for governments, especially those in receipt of Chinese assistance. How long this simultaneously centralising and decentralising change process will last is unclear. Much of it is left very open. For example, although the legislation says that a project database will be created, there are no dates for when this will be done. But having gone through such changes in other organisations, I imagine this will mean very intensive work for staff at headquarters in Beijing to prepare these items during the coming year. There are also certain details that remain unclear – for example, what will the role of major partnership meetings such as the Forum for China Africa Cooperation, the China, Latin American and Caribbean forum be in determining assistance and country priorities, and what about cooperation to tackle climate change, which is managed by China’s National Development and Reform Commission and is set to rise in 2015 and beyond. These details might or might not become clearer in the new year. But that’s why UNDP China is supporting the Chinese government to explore and deliver these change processes, as well as helping other countries and stakeholders understand what the change processes mean for them. For instance, to coincide with the new legislation, we have published a paper on evaluation techniques that other countries use and another on what this means for China specifically. We plan to do much more of this kind of work in 2015, charting and helping shape China’s foreign assistance change process, however centralised or decentralised it will be.